I like eating oatmeal for breakfast, and usually have it at least once a week during the colder months. Unfortunately during the summer it’s usually too hot for me to want to eat something hot for breakfast. But this year instead of giving up on oatmeal for the next 3ish months I decided to try working it into some of my smoothies. In my research I noticed that most people just toss oatmeal into the smoothie and let it absorb the liquid for a few minutes before blending. But I didn’t want this to be a smoothie that just happened to have oats in it…I wanted it to be an oatmeal smoothie. So I decided to mix things up and use overnight oatmeal in my smoothie. Overnight refrigerator oatmeal is made by mixing oats, milk, yogurt and other flavorings in a container and letting it sit in the fridge overnight. By morning the oatmeal is nice and soft and ready to eat. So this smoothie involves a bit of advanced planning, but I think it’s worth it. The night before, combine the first 4 ingredients in a container. Stir well, cover, and leave in the fridge overnight (about 6-8 hours). If you want more or less oatmeal, you can easily alter the recipe, just keep an even ratio of oats, yogurt, and milk. 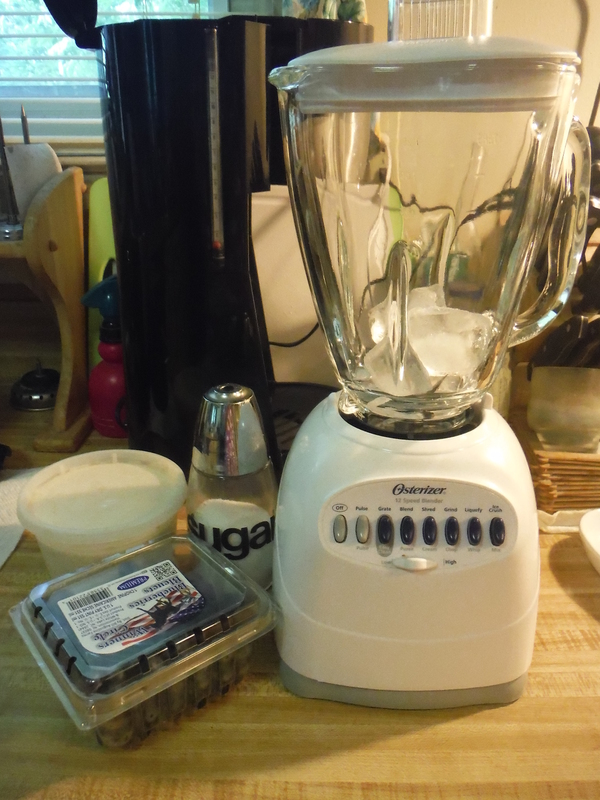 To make the smoothie, pour the oatmeal, ice cubes and blueberries into the blender. Blend until ice, oatmeal, and blueberries are smooth. Taste, and add sugar and salt as needed. Blend well. Pour into a tall glass and enjoy! Again, just coincidence that blue smoothie ended up in blue cup. This smoothie really is just like drinking oatmeal (which isn’t a gross as it sounds, I swear). If you want less oatmeal flavor you can add more fruit. Either way, it’s very creamy and filling, and definitely a good way to satisfy an oatmeal craving in the summer. 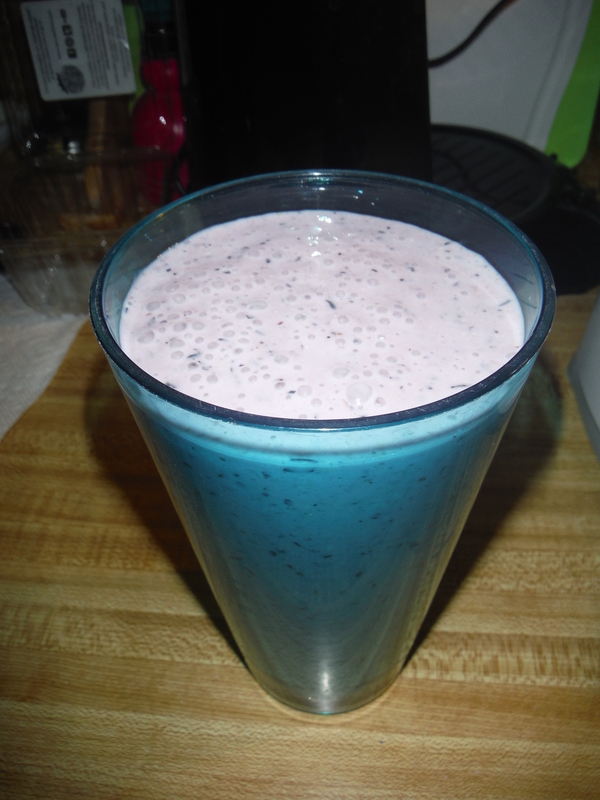 Posted on July 13, 2014, in Etcetera and tagged blueberry, breakfast, easy, gluten-free, healthy, It's a winning combination, oatmeal, recipes, smoothie, Smoothie Sunday, summer, yummy. Bookmark the permalink. Leave a comment.